The story of Santa Claus begins with St. Nicholas, who was born on March 15, 270AD in the village of Patara located in Lycia, Turkey. He dedicated his life to serving God, and was made Bishop of Myra as a young man, known for his generosity to those in need and his love for children. In Who Was St. Nicholas? And What is his Connection to Santa Claus? 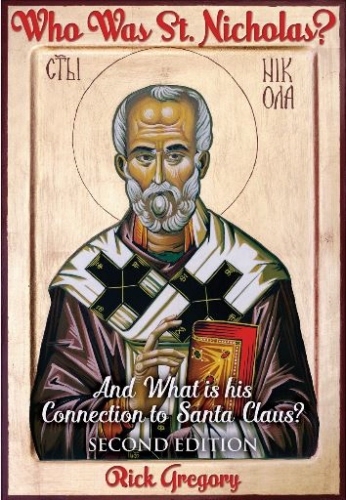 Rick Gregory dives into the mysterious life of St. Nicholas. His life as a young man, how he became a bishop and all of the miracles that are associated with him that through the ages morphed into the mythological fantasy world of Santa Claus. One of the oldest stories of St. Nicholas, which gave us the tradition of hanging stockings on the mantelpiece comes from the story of a man with three daughters who was so poor he could not afford offering prospective husbands a dowry. In those days, the larger the dowry, the better chance that a young woman would find a good husband. It came to pass that on three different nights, bags of gold, tossed through an open window, mysteriously appeared in stockings left before the fire to dry. This led to the custom of children hanging stockings on the mantelpiece, eagerly awaiting gifts from Saint Nicholas. Children around the world know and love St. Nicholas - for he gave to those in need, expecting nothing for himself in return. Through the centuries, this compassionate friend of children gave gifts on December 5th, known as St. Nicholas Day that usually came in the form of good things to eat: apples, oranges, nuts, and eventually cookies and sweets. Soon, the methods of how St. Nicholas gave gifts shifted from tossing bags of goodies through the window to chimneys. As gift-giving spread across Europe, St. Nicholas Feast Day - December 6th, was celebrated by all walks of life as the primary day of giving gifts. Whether gifts are given on Nicholas' feast or at Christmas, his example inspires charity and generosity - the core traits of Santa Claus. Throughout the world, St. Nicholas is known to travel about the country side, visiting schools and homes to find out if children are good or bad. He travels by night finding carrots and hay for his flying horse along with a wish list from children of what they would like to receive. Some of these gifts come in the form of treats left in stockings so that the children will know he came to visit. However, it was not uncommon for a child, who was not so good, to be left a stick, swatch or a lump of coal - a warning from St. Nicholas to better watch out. These are just some of the stories that Rick Gregory brings to life as he investigates the myths and legends of St. Nicholas, and how his story gave us our Christmas traditions we cherish and enjoy today. Christmas is more than gift giving, singing Christmas carols, and tree decorating. It's a time of reflection. To stop and admire the miracles around us. The miracle of Life. Love and charity. As we celebrate Christmas and enjoy the fairy tales of the North Pole, flying reindeer, and elves - let us not forget the true meaning of Christmas. The miracle birth that took place in Bethlehem. Because that's what Christmas is really all about.